Click on the History Channel or open up a high school textbook, and you might end up concluding that World War II was exclusively won by troops and generals on the frontlines, and the wills and whims of national figureheads like Franklin Roosevelt, Winston Churchill, and Joseph Stalin. The reality is—of course—much more complex, with generalists and specialists engaging in important battles to win wars of information, communication, infrastructure, and technology. Sometimes this meant storming the beaches of Normandy, and sometimes this meant, say, drafting posters to school soldiers on the dangers of venereal disease. With that in mind, here are ten of the oddest, most interesting jobs American soldiers took on during World War II, lifted directly from the United States’ 1944 Military Occupational Classification guide [PDF]. No single military classification ended up packing more cultural power in a small group than the elite team of nine American WWII “playwrights.” The squad included the four-headed monster of Marvel mastermind Stan Lee, Pulitzer Prize and Academy Award winner William Saroyan, all-time directing great Frank Capra, and a fellow named Theodore Geisel, who also used the pseudonym Dr. Seuss and wrote every book you read between ages three and 10. "Civilian experience in writing or adapting scripts or scenarios for radio, stage, or motion pictures is required," the manual notes. But apparently, it wasn’t all as glamorous as it sounds—the absurdly talented crew put their skills not just to writing films but also to tasks like writing training manuals and pamphlets on avoiding venereal disease. However, Geisel and Capra would go on to celebrate victory by teaming up for this incredibly eerie piece of anti-German propaganda for occupying American troops. Being an American classified as “Artist” during World War II was far from the cushy paint-pretty-pictures-until-the-troops-come-home position you might imagine. While duties included making “paintings, illustrations, layouts, sketches or designs,” occasionally lives, and even the outcomes of major battles, hinged on artists’ abilities. How? American artists were partially responsible for pulling off some of the Allies’ most massive deceptions of the war, designing decoy armies of inflatable rubber vehicles and other oddities meant to throw off German intelligence. Their operations also notably resulted in awesome pictures like this, of people picking tanks up like it ain’t nothing. Artists ended up being crucial to one of the most important deceptions of World War II—the now-infamous and wildly successful Operation Fortitude, which left German intelligence officers convinced an allied invasion of France would take place near Pas-de-Calais rather than the the Caen-Cotentin region of Normandy, where the Allies ultimately landed. The Russians deployed anti-tank dogs, trained to carry explosives to German tanks during the War, but—as any dog lover is surely happy to hear—the United States K-9 corps, which included dogs donated by families to aid in the American war effort, executed more traditional military duties, sniffing out enemy positions, detecting mines and traps, and carrying messages and supplies. 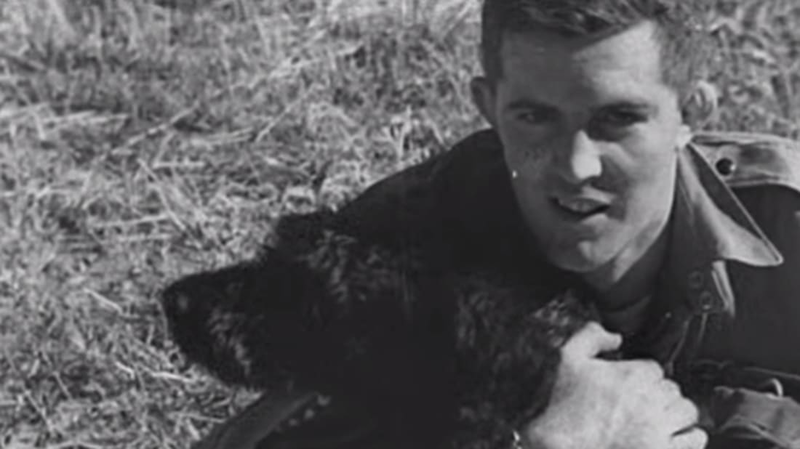 One dog named Chips was even awarded a Silver Star for heroism and a Purple Heart, until the killjoys at the War Department ultimately determined that dogs were classified as “equipment” and ruled Chips ineligible. One American World War II Combat Dog Handler, William W. Putney, wrote that because dogs and their handlers often trekked out in front of troops, it was “one of the most dangerous jobs in World War II.” Dogs also played a major role on D-Day, parachuting in alongside British troops for the invasion. Seriously. That’s something that actually happened. Perhaps the most strangely specific military class during the war, anyone with the title Link Celestial Navigation Trainer Operator would have been, broadly, a person who helped prepare aviation crews for battle. More specifically, they would have controlled a strange-yet-slightly-ingenious device that combined flight simulation with cutting edge (for the time) projector technology. Created for the war by aviation pioneer Edwin A. Link, the Celestial Navigation Trainer (CNT) was essentially a flight simulator housed in an air-conditioned silo, with either stars projected on a screen above to give the appearance of night, or terrain projected below to give the appearance of day. The trainer would control weather variables while the crew-in-training would take aim at targets, making it something like what the kids today call a video game. One for the “probably not as much fun as it sounds” category, the business of balloon rigging was an important part of aerial warfare during World War II. On the Allied side, large, stationary balloons tethered with steel cables were frequently used to prevent or manipulate air attacks. The British were particularly fond of barrage balloons, using thousands to counter German air attacks. At the height of the war, they were an especially common sight in the London skies. If you were in the right spot at the right time, you also might have spotted a few balloons over American soil, since they were used by Canadian and American forces [PDF] to protect the Soo Locks, which run along a common border between Lake Superior and Lake Huron. The balloons became a curiosity and occasionally, a menace in the area, blowing out windows upon accidental explosion and damaging property upon breaking free from time to time. Pretty much the oldest trick in the field of battle book, smoke screens were still a major part of battle during World War II, and were particularly useful for throwing off enemies in the open seas. Smoke Generator Operators were responsible for maintaining a portable smoke generator, taking into account wind and weather while laying down screens for offensive operations and covers. Fun fact: the smoke screen technology widely used by the United States during World War II was first developed by New Orleans bootlegger Alonzo C. Patterson—he used the screens to keep his rum-running boats hidden from police during Prohibition. Another one to mark off in the “actually way more important than it sounds” tally, artillery sound recorders were crucial to helping to track the origin of enemy gunfire using sets of microphones strategically placed along front lines. A new technology [PDF] during World War I, by World War II sound ranging had become so sophisticated that, much of the time, sound ranging teams could actually determine the weapons being used based on the shape of the sound waves they produced. As you can imagine, this information was very useful in the heat of battle. If Mike Tyson has a favorite WWII military classification, it's probably Pigeoneers. They were part of the United States Army Pigeon Service, which included some 3150 soldiers and 54,000 pigeons, who delivered their undetectable messages with an astounding 90 percent success rate. One American pigeon known as G.I. Joe even received a medal for gallantry after delivering a vital, last-minute message informing British forces that an Italian village was under British control, thus preventing a friendly fire disaster that might have resulted in roughly a thousand deaths. Far from grunt manual laborers, Crystal Grinders were specialists who had the hands and precision necessary to craft quartz wafers to be used as oscillators in radio transmitters and receivers. This was, of course, very much necessary for the United States war effort. In fact, the United States’ struggle to perfect quartz-based radio communication has been called America’s most massive scientific World War II undertaking outside of the Manhattan Project. The techniques that were revolutionized at the time are now widely used in wristwatches, clocks, radios, computers, and cellphones. The history of quartz in the 20th century: slightly more interesting than it sounds! Getting quality army bands together to perform at recruiting drives, concerts, ceremonies, and even to entertain troops on the front lines was considered no small thing after the United States dove into the war following Pearl Harbor—the War Department founded an emergency Army Music School to train the roughly 500 military bands deemed necessary for the war effort. With a straight-to-the-point description in the classification manual (“Plays a euphonium or baritone in a military band”), a large part of a military bandsman's job was delivering tunes to the troops. However, bandsmen also chipped in by guarding supplies, and occasionally replacing troops on the lines. Members of the 28th Infantry Division Band were distinguished for their bravery during the Battle of the Bulge, taking up arms and losing 46 of their 60 men in the battle.